Daniel Kodi, Sudan's Minister of Animal Resources and Fishery, is one of the most prominent Nuba in the SPLM. In a three hour interview he talks about his life; about the struggle and about the present situation in Sudan, with a frankness that is remarkable. I was born in Kubang, near Heiban, between 1948 and 1950-something; I don't know exactly because we didn't have birth certificates in the past. We were ten children from one father and one mother: five girls, five boys. I'm number three but before me were two daughters, so I'm an elder son. Traditionally in the Nuba Mountains, the first son is going to take care of the rest of the family in the future, so he is very important and he has to be prepared to be the head of the family. My family is religious, we are Protestants. There was a combined Australian and New Zealand mission in Heiban. My mother lost her father when she was very young, so she was taken to the missionary by a lady called Jenkins: Miss Jenkins from Australia. My father was a student in the missionary... that's where they met and agreed to get married. In the Nuba Mountains, when you want to take a child out from suckling, you take it to the grandmother to take care of the baby, away from the milk. So I too was taken to my grandmother... Miss Jenkins. She took care of me. Somewhere in the late fifties I was taken to bush school. We had bush school; then you go to elementary school; then intermediate school; secondary school and then the higher education which is university or any college. The family was poor and with ten children you can imagine it was not easy. But my father insisted and he put every effort to let me study. Being his future or the future of the family, I was taken to bush school in Heiban where I was supervised by Miss Jenkins. Finishing from the bush school in Heiban, I went to Kauda elementary school - I think it was in 1962 - and from there I went to Katcha intermediate school. The school in Katcha used to be run by the Canterbury Church Mission Society but by the time I came there, it had been Sudanised by the Minister of Education. And let me tell you something: by then - it was 1964 - pupils from twenty-two elementary schools were competing for forty-two places in Katcha intermediate. Actually there were only forty places: two were reserves... So you can imagine how difficult it was for a child to take every next step. To enter in intermediate school was something like a miracle. You had to work hard, you had to be intelligent. Some pupils used to repeat again and again until they pass among those forty, but thank God I did it in one time. From Katcha I went to Kadugli secondary school; I was the only boy from Kubang village to reach the secondary school. After Kadugli secondary school I was to sit for the Sudan Certificate [that you need to pass before entering higher education]. However, I decided not to apply for the university. I simply couldn't continue studying because of the family situation. I had to help my father and I also wanted to give my younger brothers and sisters a chance to have some kind of education. It was a moral obligation. I took the decision alone, without consulting my father. I didn't apply for university but I started working in stead - simply to help. I worked as a teacher in an elementary school in Gazeira Province. It was in a place just east of the Blue Nile, in Shukria land. All Arabs, the Shukria tribe; all Muslims - and I was a Christian and a Nuba. The people treated me nicely though; I was not from the area, I had no relatives there, but I worked hard and that brought some kind of respect. One time the chief commented that "this boy is actually a very nice man - but unfortunately he's a Christian". Had I been a Muslim, I could have married his daughter. In 1974 I was recalled to South Kordofan, as the Province was called by then. It was during Nimeiri's first years, a period of religious tolerance, when the Christian religion was a part of the education for Christian children. The people of the area didn't want to let me go. They even came to protest in the Ministry of Education in Khartoum, but the one in charge of this education and transfer system told them frankly: "This man is needed in South Kordofan. He's a Christian; he's a teacher, so he has to go and teach Christian religion in his home area." This is a period of religious tolerance in the Sudan? Exactly. It was during Nimeiri's time, when the Christian religion was even a part of the education for Christian children. So I went to South Kordofan, to a place called Atmur, this is in Moro land, east of Kadugli. I stayed in Atmur for one year, then I was called for a Christian course in Khartoum. It was sponsored by the Ministry of Education. From there I went to Atmur again, but in 1975 I was transferred again to Kadugli. That is the period when I was teaching. In Kadugli in 1975 I was asked to join NRWA; it was an organisation which gave training while people are working. I think it is effectively working in Palestine. It was also operating in Sudan but it did not continue for long. Then I had to go to Dilling, this is a teachers' Institute - I taught there. Then I came back to Kadugli, the same school. Apart form Christian religion I was teaching other subjects of course - all of it. Mathematics... all the subjects in the school. And I was not only teaching the elementary school but also the Christian religion to the other levels. Besides my teaching, by the way, in that period I was also active in the Catholic Church. I was the chairman of the parish committee; I also was a full member of the diocese of El Obeid. In 1979 I was a member of the delegation that went to the ordination of Bishop Lukudu Loro in the Vatican in Rome. Paulino Lukudu is now Arch Bishop of Juba. He was ordained in 1979. I had the time also to tour Italy, going up to Verona and the rest of the mayor towns - it was my first time to leave Sudan. It was a surprise when I was selected among others. I went to Juba, Kalikal, that was in 1980, 1981 to work with small Christian communities, conducting seminars, courses or trainings. I came back again to Kadugli in 1981. In 1981 there was this election for the Regional Government of El Obeid whereby the late Yousif Kuwa participated. We seconded him to go for elections. Maybe from the end of 1975 when I was teaching up to 1982, we have been active, especially the youth - I think you know this story? That's right: the Komolo movement. I was active in that movement. I can not actually say the name of somebody who formed the Komolo. I think this question is very important. Because in secondary school, when we were still students, we had what you call the Student Associations, especially in secondary schools and University Associations. In the holidays, these associations actually had a program in the area for the literacy; some activities down there. That was part of activities of the Ministry of Education actually. The students had to form their societies and do some activities during their holidays in their communities. Mainly our people were talking about 'let us help with the education and the illiteracy in our area'. Then these associations work among the people. And then they started to have a say in the political practice. Then those of Yousif - Yousif also was a teacher in various schools, I think you know - and then he had to go back to university. And then the idea of the political work came automatically from out of these activities of the students. I mean to say that while they have these activities of teaching the elderly people and then doing some social work, educational activities, now there happened to them that there's a problem. So we started to talk to the students, not in the university. By then we are teachers, so we start also to include those who had been active in the secret school societies. And so on and so on. And we formed a small nuclear. Yousif was there. That's a diversion of us being in the university. He was selected to be the leader of - al though he was not even a doctor by then; he was still a student because he came to be a teacher in Kadugli by himself in 1981. And that was the same year when he was also being a candidate of that election for the Regional Assembly. But there were some others. Some of them have gone away, some of them are still alive - some of us are still alive. Father Philip presents the story as if he personally introduced the concept of the Komolo movement to the Nuba youth. I am sorry to say it, but it is not true. When we came together as Komolo, we didn't involve the elders, especially the elder generation of politicians. We didn't involve them. And they were actually suspicious of what we were doing. And they though that this was just something small and it was just foolish like the rest, in that level of being youth. All the politicians were out by then. They were out. I was not a politician, Yousif was not a politician, nobody was of those whom we can see now; they were not politicians. We were just students and some teachers - a young generation; we didn't involve elders at all. And your personal reason to become active? The way how I grew up, being an elder son, I used to have some responsibilities within the family. Not within the family as such but within the clan. As I told you my father and mother are religious so I have to receive people, welcome people when they are coming to my family, well, this thing just grew with me; it was a gift, even. So we started now going into politics, but by then because it was Nimeiri's regime - and that was a dictator regime of course; it was only one party - we decided that we had to enter or to descend from this social work activities to politics and try to get some kind of orientation to our people that there is a problem in the Nuba Mountains, we have been neglected, we have all these problems - the backwardness, the lack of development, we have been treated as second class citizens. We're the endogenous people of the Sudan; we have to come back to our rots. Because by then, the Christianity came and made some efforts to attract, in one way or another, people to be Christians. Islam also came to attract. By then we just have these traditional African religions, and it came also that there was a kind of destruction of the Nuba society. Being a Muslim, that means your brother who's a Christian you are not in a good relationship. And your father to your grandmother who is still practising these African religions, we look at them as infidels. So the element of religion also can make some kind of destruction to the Nuba people to that extend and unfortunately people, others, the outsiders, were instigating this kind of differences. It was not our will to create that kind of differences, but it was the outsiders, it was the Christians or the Muslims. That is history and it was time to talk about it. And there was also competition, to attract more from this side and the other side. This was also a big problem to us and we had to correct it. Being Nuba - we have been created as Nuba - there was no way for us to make some kind of differences because of the religion and I think up to now the Nuba people are the most tolerant in the religious side. We go back. We tried to enter in politics in a very low profile, entering into this Sudan Socialist Union, the only party that was left. And we met a lot of people and we enter the grass roots levels and on and on and up and up till they created this new system of having a Regional Parliament and a National Parliament. Yousif was nominated by us to contest and it was something of a joke to our elders and to others. Yousif was just a teacher by then, just a teacher in the Kadugli Secondary School. He doesn't have any money, he doesn't have that background of being a son of a chief - you know, those symptoms which used to create the politicians by then. You should be rich, you must be from a royal family, well known, and also have experience according to their understanding. Not young, like Yousif by then. My house was operation room in Kadugli for Yousif's election. And he won. And that was a signal to the other political parties and the rest of our people that there is something going on. But I just want to tell you up to that stage, nobody knew that we were existing. They started to name us different names. The Youth Movement, the Black Rock, what, what, several names and actually the Government was not easy about it. There is something going on but they cannot even touch it. Good. In the same year, this is at the end of 1981, now the National assembly was to be elected. I was just in my office, I didn't have an idea but somebody came with a bicycle and told me "Daniel, yesterday we didn't invite you for a meeting but we have already agreed that you have to contest for the National Assembly." I know the person. I told him: "are you crazy?" Well, he should be crazy because I was a mere teacher, my salary was 166 Pound. I'm not from the royal family, I am not a Muslim even; I'm a Christian. There's so many elements which can not qualify me to sit for elections, but it is not even local elections but for the National Assembly. In the National Parliament. So that is another thing altogether. In this regard you have to pay one hundred Pounds when you fill in the application. Of course I didn't have one hundred. I could not even save one hundred Pounds by then, knowing my situation, my family situation. That one hundred, well, we started of course to make the manifesto off my elections and then how to go around it. Something came and just from office to our colleagues here and there, people collected one hundred and eight Pounds. So I went and paid one hundred and I was very happy they I had an extra 800 in my pocket. That time of course, according to our rules, when we are given an assignment we have to fulfil it anyhow. So I have to accept+ I can not resist because that was just our rule and after all this is the choice of the people. If I succeed, this is the people who succeeded. If I fail, then this is also the failure of our people. It's just like that. It was a given situation which I cannot do anything about it. Well, we didn't have any car, we didn't have money, we didn't have what, what. Of course you know, worldwide, if someone is contesting in such conditions - you need means to move, to talk to make rallies. I was 30, I was the youngest. I was 30 something years. From just a mere teacher, from that Christian background. We started and we decided that we have to use a bicycle as we used to go during Yousif's elections. And we asked our colleagues, the Komolos you can say, everyone who has a bicycle has to, it has to be rallied in one place - of one of our martyrs who has been killed - make check. But that bicycles were offered to us, it was going to be distributed according to directions of those who were doing all the campaigning. I myself of course didn't have a bicycle. But that man who was with us, he had a shop of mending the bicycles, and he had a skeleton, a Raleigh. And he said: this one will be for the MP. So the rest have to contribute. Some bring the tires and the saddle; some were bringing other parts of the bicycle until it was a very nice bicycle with wind screens here and there on the both sides. It was a beautiful thing to see this kind of oneness which you have created. And you can see late Yousif was very, very wise. Because during his campaign I told you that my house was an operation room and all of us we forgot our tribes and about our religions. That was a first step where the youth of the Nuba Mountains came to unite, to just be as Nuba. So I think he was also influential when that meeting was held, that as far as he was a Muslim who was elected to the Regional Parliament, and to make everybody know that we don't have tribes or religion diversities, I think he was influential that Daniel should be the candidate for the National Assembly. At least to give our people the signal that we're Nuba, without the whether we are Christian or Muslim or we are from Miri or from Heiban or any other tribal area. That was our cause. And it happened! Those who were contesting with me were 13. Rich people, experienced people, but when I went to pay that money, the suspicion again came up, from those who were contesting with me. Because they have seen it in Yousif's election. And some of them decided to withdraw; one by one, one by one they leave, until we remain two. I remained with one of my uncles. This was Mohamed, Sheikh alDin Sharif, who was a colleague to father Philip. They went out together and they came during the reconciliation. They came together and said to the people for these elections the votes should be given to them. Put in mind these people are poor now and they are talking about the Nuba problem, but Father Philip is coming back so they must have a full support from us so that the authorities, the Central Government, would take them seriously. That they went out for the cause of the people and that's why they are here. Both of them won elections, Father Philip and Mohamed Sheikh alDin Sharif. And imagine now: Father Philip is a Christian, Mohamed Sheikh alDin Sharif is not only a Muslim, but a scholar. He was a special religious adviser for Idi Amin. So he was the only person from the 13 who insisted to compete. And we tried actually to convince him. We had two, three meetings with him. We had to respect him as an elder, somebody who was working for the Nuba Mountains problem, but that decision of us, we thought that we should adhere to it. Eventually we have. Well, he was 100% convinced that he is going to win, simply because he has the facilities and I had nothing. All the differences I told you before. No money - he has money; no cars - he has. He has the political background, he's an elder than me, he's a Muslim... everything: all the qualifications of that époque. Well, I used that bicycle. You see, this constituency of mine, it consisted of six local governments. You have the Kadugli Town, you have Rif el Shergi and Rif el Gharbie - this is east of Kadugli municipality - and west of Kadugli is Miri area; we have it all: the whole Heiban county and the whole Burham county, we have the whole Um Dorein county - this is all one geographical area. And there were about 126 polling stations. Not with a bicycle... even if I had had a helicopter, I wouldn't have covered all. But we moved slowly in all direction. Putting those of Miri area to go to Miri Area and those who are from this area they go there and I only went to - I made rallies of course in Kadugli, and then I had to go to my home town, Heiban. At least, you have to be blessed by your people. And then I went to el Burham area up to Toroji area, because I had never been there, and I am not well known there also. I had to show myself there. And how did the people react when you showed up on your bicycle? I thank God that we were using bicycles, because the one who was contesting with me was faster than me. And his rallies... first of all he used to recruit the chiefs - it is a normal thing: it means the rest of his people will be with you - and unfortunately he was genuine in his... When you're competing, you have to convince people; instead of convincing people that he is capable to be elected, he used to make it another way - to talk about me, giving all this "this is a young man, he is not experienced in work, he went up to Uganda, he's still young, he's a Christian..." A negative campaign. He was not talking about who he is, but he was just campaigning against me. So of course he moves, and we move behind him. And we had nothing; we had to be very practical. Our people even travelled on his busses. We had nothing to lose. Only a bicycle. Now when we go to a certain village or a place or a station, first of all now we have to know where he came and stayed - and we go also. Whether he is a chief or a merchant or whoever is there. In the Nuba Mountains, when a guest comes to your house, you don't chase him away, even if you think you are against him politically. And this is what I did, even when I was in Nairobi as a rallyist, these people of the Government of Sudan from the Nuba Mountains cannot chase their people visiting you of course, even if we are from different sides. We used to talk to them very frankly: "we have been thirteen, we are now remaining two. I'm very young, you people, I'm not experienced in politics, I'm a mere teacher, I used to tell them who am I. Very frankly. "And I'm not going to promise you anything. What we want in this time: that you give a chance to your youth, to your children. We are teachers, we have educated ourselves and now we have to educate them so that they have also experience in the future. But also in front of us, that is our uncle. We don't have any problem with him. He is somebody who has fought and struggled for the Nuba case and we don't have anything bad about him, because we were the ones who actually worked for him when we went for the first elections. So you just chose. If you think that he has to continue, that's your choice. And if you feel that you have to give us a chance, as youth, that will be okay. And no promises: I'm not going to bring you a school or bring a bore well or whatsoever, because I'm going to the National Assembly, which is actually serving the whole country; it is not something localised." That was a very simple manifesto. In this regard also I have to mention something. The one that was contesting with me, Mohamed Sheikh el Din - he's from Mendi by the way, near Kauda - when we're counting the votes, there is a curiosity from the Arabs and other none-Nuba, the merchants who are there from the North, because now it is a competition between two people from the same area. People were curious to see how I was going to fail. This young man with no experience, he was going to be defeated but they wanted to see how badly I would lose. I was in the house of my friend in Hajr el Mek, I was quiet, very quiet and very calm, believe me, I was very, very calm. I didn't have anything and I slept when I took my breakfast. I slept up to the time they woke me up again to take my lunch. And I remember the old man the father of my friend, he's called Kuku, he was really astonished and surprised: "You boy, you're not nervous? You're so calm, sitting there..." In the end of the day, somebody came running from there and he told me that I have won. And people started rushing. Most of them don't know where I was around. But those who discovered me, they had to congratulate me. By how much did you win? I can't remember, but there wasn't any discussion. I told you that because we don't have money, and we don't have means of transport to bring people to the voting stations, so we used his cars and we used his own people. And his secretary was one of us. We know the tactics and we countered it. However: I won. And it was a surprise to everybody. For me, I was not surprised. Because the campaign by itself, it was reasonable; I felt that people realised the difference between the two candidates. Of course hard work being done by the youth. The directions or the areas where the campaign was, was done by the sons and daughters of the areas, who have also saved elections for me. After they announce my winning, a very big demonstration took place from the Youth party, roaming the whole town, something you cannot imagine. Of course I didn't have a car to take me to my house to receive the congratulations. The church has to volunteer to bring me a Land Rover - from a bicycle tot a Land rover Station, it was a good step. I remember father John Vince, he was the one who was driving the Land rover, and he brought me some pills. He said: "people are nervous and I am nervous; if you need them, you can take two". I told him: "no, I don't want, I'm not nervous". I had only one tukul there, that was all my belonging by then: one tukul, no more. And now, I can tell you, I don't have even a tukul or a chicken. So people were rejoicing and dancing and I found so many things in the house which I had never seen. I found the sugar, sweets and juice, whatsoever. Everybody was bringing things and the tea was served and whatsoever was served, but I didn't pay anything. I didn't know from where the people - maybe some of them I remember but some of them I don't know. Being somebody who has been elected by the people, representing in the National Assembly, it was a great challenge to me personally; it was a challenge to my colleagues and all those who voted for me. So I have to shoulder that challenge, hoping that I will arrive to do something good to our people. And I was shocked when we had the very first meeting with the Sudan Socialist Union (SSU). We are only one party, and we have to meet before the opening of the Assembly. They have invited people from all over the world to attend the opening session, but we have to meet as a Parliament before. So that evening I went. And President Nimeiri, who was the chairman of the SSU, opened the meeting. He gave a very nice speech and he congratulated every one of us for having that mandate from its people and so and so - a strong political speech that was good up to that stage. Then he said: "okay, as a one party, and of course you have the rules of the party and it is bound to everybody; the basic rules of the party. And before we are going to the opening session tomorrow, we have to nominate our people; we have to make them ready there. We have to chose who is going to be Speaker; who is going to be Deputy Speaker; who is going to be chairman of various committees." I think of that "well, maybe we say 'let us try to elect our candidates for being speaker, chair'" - something like that. But they said: "we have already said that Mr. X is going to be our candidate for the Speaker" and there was somebody for deputy. Everything was already arranged. No discussion, no obligation, no objection. The nominees were of course all Nimeiri's people. That's the time where I became shocked. That all that was being done by our people there, it just vanished there. The morning came and we went to the opening session, we entered, somewhat suspicious of what would happen. The Chairman greeted us and the dignitaries from various countries. Then we came to the business of the normal parliamentary procedures: "we now ant to select the Speaker of Parliament - so the floor is open!" Remember that we're one party. So somebody from there was assigned; he stood up actually and he said: "I'm selecting Mr. this and this as a Speaker, because he is this and that and that." "Who's seconding?" Somebody also from there: "I second the nomination of Mr. this and this, because of this and this and this." Then the chairman said: "is there any other candidate for the post?" No one, of course: who would be anther candidate when we agreed yesterday and we are bound with the rules of the SSU? It was just a tragedy, a show case. So this continued. I went to the committees; I was selected to be chairman of the committee for international relations. That was good. There was the African Desk, the International Relations Desk, and I was chosen to be the chairman of the subcommittee for International Relations. And I think it was good for me. It was simply - it was not because I wanted to be there, but they thought I know Arabic very well and I know English also. This committee needs someone who knows English at least. The African Desk was given to one of my colleagues, he's a Southerner, and the international Desk was given to me. Putting in mind it was not their choice actually, but maybe no one was capable to be the head of the committee. We continued just like that: things were cooked from outside and brought inside for blessing - we didn't have any say. But things also went wrong. The security started to - there is what is called qassha, I hope you have heard about it? There was something called qassha: getting rid of unwanted people out of Khartoum. Those who are jobless for that matter, those who are roaming just like that. And you can see in the morning, the police, or whatsoever force will just come and make a cordon in a marked area and they will just catch people take them to the prison and then they move them out from the town of course. Who are they? Mainly we, mainly Southerners, mainly Darfurians - those who have colour. That one was terrible. Even imagine some very senior officials from that colour, but they are also caught. When they say I'm an engineer and I'm what - no, but because of their colour they were taken, brutally, by all this kind of ruthless manner. They just throw you and take you. Tat was also something that shocked me and it made me think this is not the situation our people should be left in. As far as this nationalism that everybody was talking about it... Well these things happened in front of my eyes. There are some things that are not to be disclosed at this time. Of course we have some secrets, but starting from '82 - the opening session wan the 22nd of February, 1982 - since that time I had connections with political people from the South Sudan. That was before the SPLM/SPLA. There were some organisations who had been formed, they were most like our Komolo, where those of Dr. John, those of - we had some links together, I personally. Now this is out from our organisation completely. Anyanya II emerged, and some of our people had to move, through me. Some of them are still alive, they are still commanders, you might know some of them. I had my secret contacts here and there, so when the SPLA emerged with these incidents [at Bor], I was already aware in one way or another. And I was already recruited by them, in one way or another. Even before the establishment of the SPLA we rebelled in the Nuba Mountains. Since 1982, those who had gone to Ethiopia to join the Anyanya II had been trained there and they now came back. The political process had failed and we wanted to give a signal [to the government in Khartoum]. We made only one operation: a raid on a small police station in Umdulu, carried out under Mubaruk al Mek in 1983. We have been training many people by the few guns [that they captured]: to assemble and dissemble and what and what. We had our head quarter in Heiban where the training took place. So I can say the armed struggle started before the SPLA was born. And General Siwar al Dahab was asked to by the Assembly to come and give a statement about what was happening in the Nuba Mountains. At that time I was still in the assembly. When the issue of Shari'a Law came in - we had to protest against it. But the technical majority prevailed of course, so the Shari'a was applied. And then they tried to establish an Islamic Constitution; we managed to prevent it to pass - and it is a long story also. I was involved with Father Philip in the coup of 1984 and I was taken to the security cells and from there to Kober prison and then I was released. By then we had correspondence with Dr. John, the SPLM, and they sent me the Manifesto. And as I'm talking to you now, I know where the Manifesto is: it is hidden somewhere under the ground here in Umdorman - the original Manifesto, by his signature! No, I won't tell you where it is. In 1983 the SPLA took up arms, they established a local government for the South and they had made some small progress because they had taken up arms. And reading the Manifesto we found that our case was not different from the case of the Southerners. Our only fear was that they still had the same agenda from 1955, calling for the separation of the South, instead of really fighting for justice and equality and all these things which had been our aspiration as Sudanese. Personally when I read the Manifesto I smelled socialist perfume. When the Southerners started this mutiny in Bor and Pibor it was with two battalions only. Half of the soldiers - the remnants of Anyanya I - were illiterate, if not all of them. You cannot imagine somebody from this background in Southern Sudan to be convinced to be a socialist or a communist or an imperialist - this cannot be digested of course. Someone like Dr. John might have that kind of mentality but he would not use such language to lead the people. Because you go through several stages of the resistance and the education before you come to the stage where the fighters might consider themselves as communists or others as imperialists. That was not an issue. The issue in the South was that there was a problem in the Sudan: there was inequality, there were injustice and backwardness: problems. That was my analyses and that's why I also decided to go and join the Movement. And at the end of the day my analyses was correct: those who rebelled in Bor had no other choice then going to the Ethiopian border - a socialist oriented country. They found themselves in this situation, so they had to dance the same rhythm. The rhythm of the time. Now there was no use for me to stay. I was exposed. Before that of course Yousif went there, and three other guys, some of them are still alive. That was Yousif Karra, Ouad el Karim, Telefon Kuku. Yousif went ahead and then they followed. I was told by Dr. John himself "you are now exposed; there is no more use for you to stay." So I left Khartoum. Because Yousif went through Nairobi I had to take another road, it was through Arab countries. I went to Egypt, from Egypt to Jeddah in Saudi Arabia, from Saudi Arabia to Addis Abeba. They walked all the way, yes, most of them - 99%. And they met with very difficult situations. Some have been caught, some of them have been lost, some of them have been killed. But there was a determination to join the Movement. So, now I've reached Addis Abeba. I'm a member of SPLM/SPLA. I left my seat of course. It was strange to go from being in the National Assembly to being a guerrilla - to stay in the forest. They always imagine it like that. Living a good life as an MP, it was not an easy decision to go. I knew I may not come back, I knew I would face a lot of problems, I was going to a place I had never seen before and I would be staying with people who were not familiar with the Nuba tribe as such. By then there were only four of [the Komolo]; when I went I was number six: there was one [Nuba] from another organisation who joined before me. It was not an easy decision, but by staying in the national Assembly I could not serve my people. Of those who had come before me, four went to the training centres to become commanders. Yousif [Kuwa] first went to Yemen to be the SPLM representative there, before he took his training in Cuba. Then he was appointed as alternate member in the High Command of the SPLA. When I met with Dr. John, he appointed me to stay in his office in Addis Abeba. I don't know why exactly. Maybe he needed someone in his office to represent the North. At that time Riek Machar was the head of the office. He was followed by Deng Alor and we were together with Deng Alor for some years. Then somebody called Martin Manyiel from the High Command took over and he was followed by Dr. Lam [Akol]. While I worked there I came to know Dr. John very closely. We came to discuss many issues; Sudan politics in general and Nuba Mountains' issues especially. I learned a lot, but he also wanted to learn from me. He had no political experience in the North and I came straight out of the National Assembly. There was a specific kind of relationship between us. I think it was useful for us to share ideas and some of the things we discussed were strictly between the two of us. We shared several secrets; we met people together of whom no one else knows who they are. Dr. John has died and I am now the only one who knows. I left the office in 1987, when I was assigned to take ammunition to the Volcano battalion which had gone to the Nuba Mountains. Most of the Volcanoes couldn't continue because they had run out of ammunition, and we couldn't reach the Nuba Mountains - I think you know the story? Actually most of the soldiers were from Bahr al Ghazal. They were not acquainted with the hills and the environment of the Nuba Mountains. Some of them had never seen hills or rocks. So it was not an easy assignment, away from their own familiar terrain, without ammunition... I couldn't bring the ammunition to the Nuba Mountains so I left them in a certain place in Fariang and then orders came to return back to Ethiopia. I went through political school and upon finishing it, I was commissioned as a captain. With this rank I entered Military College. I came out and went to Eastern Equatoria, commanding three battalions in the Kapoeta area. Most of the soldiers in my battalions were Southerners. They were young and they were from various tribes of the New Sudan, including Nuba, including Zande, Nuer, Shiluk, Dinka and various other tribes. I stayed in Kapoeta until 1989, when this coup took place [by Omar al Bashir]. I was sent to the first peace initiative [after an initial meeting in Addis Abeba] in Nairobi; I was the secretary of that meeting. In 1990 I was back in the South, crossing the river to Western Equatoria where I operated with my forces until 1992. I was called to return back to Nairobi to take place in the Foreign Affairs Committee. There were so many committees and we had to sit with these people. That was in 1992, '93. I went on an official trip to Egypt. It wasn't the first time for an SPLM delegation to visit Egypt by the way: we had a first secret meeting with Mubarak in 1985. It was after the fall of Nimeiri and the relationship between Sudan and Egypt was bad. We thought we might make use of the saying 'the enemy of your enemy can be your friend' - we were actually invited there. But the first official visit was in 1993. Going to Egypt was essential for the Movement because the Arab world was convinced that the SPLM/SPLA were Christian Africans fighting against Arab Muslims. So we had to change this perception which had been propagated by the successive Sudanese governments just to attract assistance from the Arab world. They would say that Arabism is in danger in Sudan; Islam is in danger in Sudan; Libya is threatening to overthrow the country and to extend its power over Sudan - all this kind of nonsense. We have never fought because of the race or the religion or anything like that. At the end of the day I think that the people can actually come out with peace in Sudan. So being in Egypt was very important and it was also good to let the Arab world know exactly what we had been doing. When Kuwait was invaded by Iraq and this operation Desert Storm was launched, we offered our help in liberating the Kuwait people, because they were being oppressed, invaded and colonised by foreign forces, just like us. It was meant to give a clear signal; we showed the Arab world our true colour. We had many interviews with TV stations and news papers. It was the most important part of my work. I was not soliciting funds of social organisations but I was making a kind of political education to the normal Arab citizen to understand who we are, to change their idea about us. On my return to Sudan in 1994 I was appointed as a representative the Middle East and the Gulf. I had already been accredited to the Vatican and to Poland in 1993, now I also represented the Movement in all the Arab countries. I have been constantly travelling, ever since I joined the Movement. Most of the delegations going up and down - I was with them. Up and down, doing political work. 1994 was also the year of the Chukudum Convention. In fact I couldn't come, but I sent my delegation. Then, when we made the first structures of the Movement: the executive and the legislative and so and so, I was appointed as Secretary for Environment Conservation and Tourism. At the same time I was elected for the NLC: the National Liberation Council. Later I also became a permanent member of the Technical Committee for Humanitarian Assistance in Geneva. That has been my portfolio these years - plus these peace talks here and there which have been crowned eventually in January 2005. You were part of a strong effort to gather international support for the Movement; can I put it that way? No, there was no international effort to help the SPLA. But there were humanitarian aspects to the fighting in Sudan: the civilian people inside contested areas received humanitarian support. There was no direct assistance to the SPLM/A, neither as a movement or a party. We had some friends of course, but they never gave us more than token donations. the rest has been from friends and sympathisers. The first years of the Movement fell in the last years of the Cold War. Until the Wall came down in 1989, everybody was watching each other - who was oriented to the West, who was oriented to the East? Because of the language of the Manifesto and because of the support from several socialist countries, people think we were oriented towards the Soviet Union. But the SPLM of those days cannot be seen as a communist movement. As I explained, we just had a problem in Sudan. Our problem was and still is uneven development, no equality, no justice and no freedom. It was our political work to make this clear to the outside world. We also were in touch with the churches. They came in when the Government started to apply Shari'a law in Sudan. In the West we [African Sudanese] are generally perceived as Christians and so there was the assumption that we were being discriminated because of the Shari'a laws. It really rallied the churches to the cause of the South. They also gave some efforts to convince the West and in fact the churches did a lot of work, especially on humanitarian grounds. The war cut off the Nuba from the world, especially after the 1991 split in the SPLM/SPLA. It led to a humanitarian tragedy during the years from 1991 to 1995. People were living a Stone Age life and there was hardly any food. My father once walked from Heiban to Burham [a four days walk up and down] just to get three measures of sorghum. During these years the Government tried to persuade us to give up the struggle. They contacted Yousif Kuwa from Kadugli and they contacted me in Nairobi - they sent me a bishop! I laughed when I saw him. Later they tried it through a clan mate; they sent a minister and they even sent a friend and someone who said he was my uncle. By 1992 many of the officers were ready to give up, mainly because they had no ammunition. They thought the South had betrayed them. There was a mutiny, several officers were arrested. At that time Yousif Kuwa called for an Advisory Council of military and civilians, to come with a decision: "should we continue fighting, or should we give up?" After many days of discussions, it was a woman who said: "we have not been fighting all these years to give up now". And the men followed. As I said: the Nuba were cut off completely. Operation Lifeline Sudan started to deal with the humanitarian crises in the country in 1989, but until 1999 the UN were denied access to the SPLM controlled area of the Nuba Mountains. In 1993 the first initiative came up to form a Nuba relief organisation. It was set up by Bashir el Dow, a Catholic priest who had been recruited by the Dinka. The organisation was called Kush and it was supported by an Italian Catholic organisation. From this initiative came the Nuba Relief Rehabilitation and Development Organisation [NRRDO]. From 1993 Yousif Kuwa was constantly travelling for the Movement, just like me, and we took the opportunity to make people outside aware of our problems and to ask for humanitarian assistance. 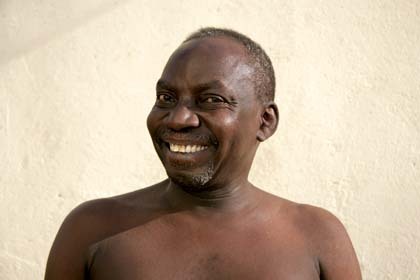 The first one to come from the outside was this man, Hugo [D'Aybaury] who made a film in 1993: 'The Right to be Nuba'. Of course Bishop Makram Max from the Diocese of El Obeid did a lot to let the world know about the problems of the Nuba people. And there was Father Kazito. I think the African Rights report of 1995, 'Facing Genocide', also had a big impact? I'm sorry to say this but I feel they were working for themselves. Can you say more about the process that led to the inclusion of the Nuba in the Comprehensive Peace Agreement? Well, in a historical perspective, the Nuba can be considered descendants of people who once ruled the Sudan. The Kushite Kingdoms, Meroe and so on. When the people came to the Nuba Mountains exactly, no one knows - they came in different times and for different reasons, whether it was famine; natural disaster; man made disaster or religious problems. There are still some linguistic similarities between Nubians in the North and the last Nuba groups to migrate to the Mountains. The last Nubian kingdom, that of Soba, fell in 1504 I believe. And from that time on, Nuba have been neglected by all the successive Governments, whether they were Egyptian or Turkish or Anglo-Turkish or eventually Sudanese. The Nuba were neglected in all aspects of life: discriminated against, living the life of second class citizens, without any rights. These reasons accumulated until the people had to take up arms to fight. So in the fifties and the early sixties some of our elders, those of Philip Abbas Ghabush, formed the first political Movement, called GUN: the General Union of Nuba. It as a good signal, it was a good start, but not more than that. It was just a racial movement, which continued like that until we founded the Komolo. That is where we accommodated all the Nuba for the first time, and were we identified the specific problems of the Nuba Mountains - that were the same as the problems of the South. Our objectives were clear, our strategy was clear, all the questions had been named, and as I told you, we even rebelled before them in a way. We could have started the rebellion before the SPLA, but we had no borders with the South: we are in the middle of the North and we could have been crushed at any time. So our leaders thought it would be better to join the rebellion in the South. We didn't join the SPLA because we wanted to join the Southerners as such, but because of the objectives of the Movement proclaimed in the Manifesto: we have the same correlatives. Secondly, the Movement is our outlet to the outside world, to make them understand our cause. And we're convinced we are not fighting for the Southerners: we're fighting for the Nuba people and this should be clear to everybody, because some people think - well, they see us as mercenaries. And as such, we are given a token gift. The issue of the Nuba Mountains, Blue Nile and Abyei was one of the most difficult protocols of this agreement to come to. Everything started with a mistake in the Declarations of Principles that IGAD [the Inter-Governmental Authority on Development, an organisation of six eastern African countries focused on drought control and development initiatives] gave to the two parties - the North and the South - during the negotiations in 1994. It was not made by the two parties, but drawn up by the mediators. It talked only about solving the problem between the North and the South, and it even mentions the border of 1956 as the division line. The Government rejected the DOP, but unfortunately the SPLM accepted it, without keeping in mind that the objectives of the Movement are to solve the problems of the Sudan, not to be rigid about Africans or Southerners or Nuba. The problems of Sudan are well known. Now they have appeared in Darfur as well. The centre and the periphery? Yes. And so accepting the DOP was a mistake. If the SPLM had just taken a closer look at it, they wouldn't have done it. The DOP are the reason why it was so difficult to enter the issues of the Nuba Mountains, Blue Nile and Abyei into the negotiations: these were not embodied in the DOP. The issues were discussed outside of IGAD first, but eventually it had to come to a comprehensive peace agreement. In this regard the whole world came to know about the suffering of the people of the Nuba Mountains. I think that was a good achievement, for the Nuba to be well known. Take yourself: if you would not have read about the war in the Nuba Mountains, you probably wouldn't have been interested to come down. It is one of the good things the Movement has done. The other good thing is that we managed to let the Nuba be proud of themselves. In the past, if you told somebody "you're a Nuba", he might deny himself. He might no longer speak his mother tongue; he might have denied his tribe. You could find Nuba people here in Khartoum who would say they're from the Moroda. Moroda is not a tribe! It's a place in Khartoum! That was the situation before. But now the Nuba people have come to realise that they are citizens of Sudan, that they have their rights - or should have their rights - and that they can be proud of their Nuba identity. But if we come to the CPA, I think it is just not good enough. It doesn't meet the aspirations of the Nuba people. Of course the people wanted self determination, which they didn't get. But there are so many other things that they wished for and that are not in the agreement, considering all the issues. Whether it is power sharing or wealth sharing; whether it is legislative or all levels of government. Our position as SPLM in the Nuba Mountains was very strong and we laid out our arguments clearly and logically. But the Nuba who were on the side of the Sudan Government really discouraged us. I can say it is a matter of betrayal to the cause of the people. When we came to talk about self-determination, they themselves were talking loudly: "we don't want this kind of self-determination". And I cannot imagine a human being, being against self-determination for himself - unless of course he's pushed by others. So many are the shortcomings to this agreement and I don't even blame the North as much as I blame my own people who are collaborating with them. This is the result. There was a time when the Government refused even to talk about the Nuba Mountains or Blue Nile or Abyei, because they were not included in the DOP. Then they were convinced that it was a problem that should be solved - but outside of IGAD. And we even left Machakos and went to Karen [a suburb of Nairobi] to discuss the issue of the three areas. There was a proposal from the mediators that the sons and daughters from the two sides - Government and SPLM - would sit together to discuss the problem, and come out with a solution. At first I didn't agree with this idea, because it would farther the issue from the SPLM as a Movement: we had to negotiate as one body. If it was left to be a Nuba-Nuba dialogue, this might become a problem. But I came to realise that if our brothers from the other side could be brave enough to put the interest of the Nuba people before their own interest or the interest of their masters, we could make a very, very nice agreement. Regardless of what Omar el Bashir or Dr. John would think, we could come together as one group of the Nuba and say: "what do we want? How do we get the maximum interest for our people?" and then to come out and tell the international community: "this is what we want". This would have been good and it was what I hoped for. But it didn't work out that way and it became a real problem. We had to come again, and come again, and negotiate as two parties - the issue was eventually included in the IGAD. Time could still be in our favour, to improve this agreement or to seek more benefits for our people. But it means that people have to be very aware of the implications of the CPA, they have to be very conscious of the choices they can make. In two years there will be elections, followed by a popular consultation that could give the possibility to adapt the protocols for the Nuba Mountains. Yes, after the elections there will be this popular consultation. And the popular consultation, if you go about it very carefully, could be even better than self-determination, because the people can include self-determination. You can make amendments to the agreement, you can add things, you can reduce others. In a way it is better than self-determination and it comes with the choice of the people. By the way, it was not only the brothers of the North who rejected self-determination. It is a general trend globally. The recommendations of the countries here and there - they were not encouraging it. Even the self-determination for the South was only accepted because it would solve a problem that has been going on for such a long time. Otherwise it is not a trend in the international community. Now, people are gathering and joining rather than making new nations - but that is another story of course. ... were not very interested in self-determination for the Nuba. Through popular consultation we can decide for ourselves what we want the protocols to be, even including self-determination. But the task is how to let our people understand this exactly; focussing on what we are going to do with the popular consultation; what are the loopholes in the agreement; how can we best improve it? After the elections we will see whether we use the agreement as it is, or whether we add to it, or whether we throw it out. Keeping in mind that the interest of the people of the Nuba Mountains must be our first concern. This is our task now. Now is the time! It needs a clear majority in the parliament to amend the protocols. I myself, if it had been my wish, I had not signed this protocol. It does not meet my aspirations, what I have worked for, what I fought for, for all these years. it was a MUST that the agreement should be signed in a way or another. At some point there were no good reasons to say: "if you don't give me fifty-fifty percent, we'll go back to war; we'll take up the gun." If they had refused it, it meant you had to go back - there would have been nobody behind you. The international community, the region: "Oh, they have to return to the negotiating table, they must achieve peace - by al means." So we were pressurised here and there. We hadn't defeated the Government; the Government hadn't defeated us, so there was this spirit of give and take and what and what. But still I can say the protocol of the Nuba Mountains and Blue Nile was unfair, and it needs a lot of work to improve it. Meanwhile there is still a lot of violence in South Kordofan. Yes, there is insecurity in South Kordofan that can harm the peace process. Let us say the agreement has not reached its people yet. They have not understood what we mean by this agreement that should actually touch the people of the grass roots. Secondly there is still no confidence between the two signing parties. No confidence at all. Unfortunately the ruling party, or former ruling party, is not yet genuine to implement the agreement itself. Not in South Kordofan and not on the National level. Number three: the arms. Fire arms are spread out in South Kordofan and there was no healing of wounds from the past. The Government instigated the Arab tribes during the war to kill the infidels, to loot their property, and so many of the Arab tribes have been killed by the Nuba. Well, we didn't kill them; they killed themselves by us. And they didn't even have a strong reason to fight. We have been living together in harmony for so many centuries. But up to now we didn't have drastic steps to bring reconciliation among the people - and that is very important. There are so many reasons. Another one is the poverty which prevails in the area: if I have a gun and I don't have my basic needs, I may be tempted to loot somebody's property - and at the same time I can be killed. And that will enlarge the conflict itself. Another problem is that on our southern borders, especially with Upper Nile, there are some armed forces that are not under any responsible command. The last and most important thing: we haven't changed the old laws yet, which are supposed to be replaced by new laws in the spirit of the agreement and the national constitution that should include respect for human rights, freedom of speech, freedom of religion, and so on. We have to changed the laws and make people aware of the changes. There are so many reasons why there is still insecurity in South Kordofan. The Governor of South Kordofan, Ismael Khamis Jelab, says the violence is a deliberate strategy of the NCP to provoke the SPLA back into fighting. Well, this is what I'm saying also, but I put it in a very diplomatic way. Your Ministry of Animal Resources and fishery seems to be very remote from the Nuba issue. Well, this is of course the Federal Government. We tackle national issues, set out the broader politics. That's why I am not really a good player in all the affairs of the Nuba People. But in politics I do have an effective role. From the top here I can push for changes on the ground. And in the coordination with the colleagues in the Nuba Mountains I have also a role to play. Moreover I have to use the resources; I have the responsibility to serve the Nuba People and the whole people of course as a national figure - not as a Nuba. My position makes it possible to be in contact with friends of the Nuba here and there: organisations or governments, to direct some kind of assistance to our people there. If you want to meet somebody as a minister, he can listen to you. It helps me to have a link with some international figures and this way I can try to move them to help the people. I am very pessimistic. I wish I had not been appointed as a minister and I don't like being here. It would be much better to be with my people there. I feel I could do much more for them. As a very senior member of the Movement there would not be many posts appropriate for you; would you have aspired to be Governor in South Kordofan? we have to have somebody here, at the National Government, and we have to have someone in the Nuba Mountains. By seniority, the posts automatically were divided this way. Everybody thought that I would be appointed there, but I myself think it would not have been the right time for me to be there. I didn't want to have a role in national politics, but I didn't aspire to become Governor either. I was thinking that maybe I could just continue being an SPLM member and to do political work among my people there. At least to educate them about what happened in Naivasha and what happened in Machakos. And how we can improve this peace agreement and what we should do to determine our own future through elections. I would be more useful to the people. Do you believe the SPLM in the Nuba Mountains will be able to rally the people behind them in the coming two years? To some extend, yes. But I am not optimistic of course, as far as I can see the realities here. One year has passed after the agreement, one year after taking the governorship, and the work is not well done. We need a bigger effort. We should be united as people of Kordofan regardless of the political parties; we should put the interest of the people first. We have to unite the people behind a simple program; we have to agree upon it - consensus regardless of party affiliation - and then we have to work according to it. I'm not against somebody from the National Congress Party or from the Sudan National Party being elected, if he has the mentality to serve his people in a good way. To put unity and the interest of the people first, this is the most important thing. If we agree on this only, that will be enough.